A sheet set is an organized and named collection of sheets from several drawing files. 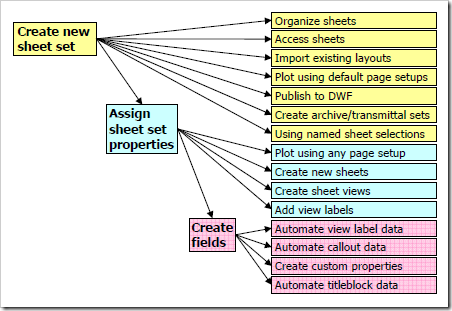 Creates a new sheet set data file that manages drawing layouts, file paths, and project data. Opens a selected sheet set. Opens the Sheet Set Manager. Closes the Sheet Set Manager. Click View tab Palettes panel Sheet Set Manager. In the Sheet Set Manager, click the Sheet Set control. Follow the steps in the Create Sheet Set wizard. Double-click a sheet set data (DST) file. In the Open Sheet Set dialog box, navigate to a folder that contains a DST file. Click the DST file and then click open. The Sheet Set Manager displays the sheet set data. NoteYou can open several sheet sets and then use the Sheet Set control to switch between them. In the Sheet Set Manager, Sheet List tab, right-click the sheet set node (at the top of the list). Click Close Sheet Set. The sheet set is no longer displayed in the Sheet Set Manager. Note Close a sheet set to reduce the number of sheet sets listed in the Sheet Set control. However, if you close a sheet set while you still have sheets in the sheet set open, you will not be able to update the Sheet List table and certain fields.